Welcome to the August segment of the Home Depot Gift Challenge. If you’re new around here, the *HDGC is a monthly challenge that a group of creative bloggers take on. Here are my projects so far… copper tee handle, industrial pipe 2 x4 shelf, concrete feather sculptures, Rope Handbag. Each month a specific item is chosen from Home Depot, and we all come up with a DIY gift for a chosen recipient. The assigned material for August was this little thingy. Everbuilt 1/2 -1 1/2 in Hose Repair Clamp. I have to say that this item stumped me more than any of the others. I had the hardest time determining what I was going to do with a hose clamp. This month we get tho create the gift for ourselves…how thoughtful of me. After overthinking this project I decided to create simple napkin rings adorned with Oyster Shells. Living near the beach, I have a collection of oyster shells waiting and ready to be used in a project. I applied a light coat of off white spray-paint to the hose repair clamps to spiff them up. With a glue-gun I attached the shells to the hose repair clamps. Since creating my sharktooth necklace I have discovered the glory of gold leafing and decided to add a little to the shells. I applied the gold leaf to each shell . I sealed the gold leaf to the shells and allowed them to dry overnight. I think that they turned out pretty good and will make a nice addition to a coastal dinner. 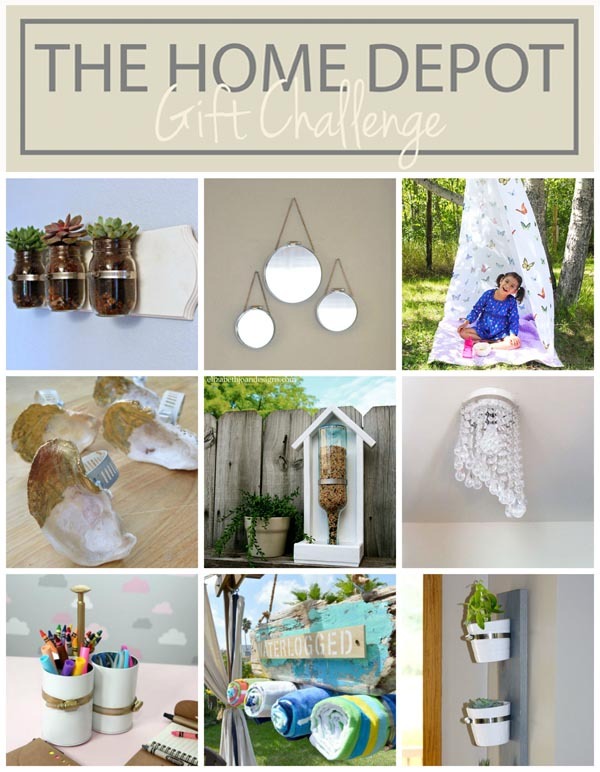 Before you go, check out the creative gifts that the other bloggers made with hose repair clips……AND Don’t Forget to enter to win a Home Depot Gift Card. Since we are talking about gifts and the Holidays being right around the corner…check out my Custom Water Color Shop. These make really awesome and thoughtful gifts. I have yet to try gold leafing, it adds a nice touch to your napkin holders! Cute ideas! Roxanne it is cheap and soooo easy. What a clever idea! I love how they turned out! They look beautiful with the napkin! What a clever idea!! The napkin rings look sooo good with the napkins inside! Just beautiful! I may have to steal your idea! Wow, Carmody! These turned out so fabulous. Love the green and gold accents. :) So clever! These are so fun!! I love that you added the gold leaf, it’s the perfect touch. I love this! And, with Thanksgiving and Christmas (I know), just around the corner, who doesn’t need super cute napkin holders?! I have made one using gold leaf on each shell and it looks great! Awesome ideas. Love it!